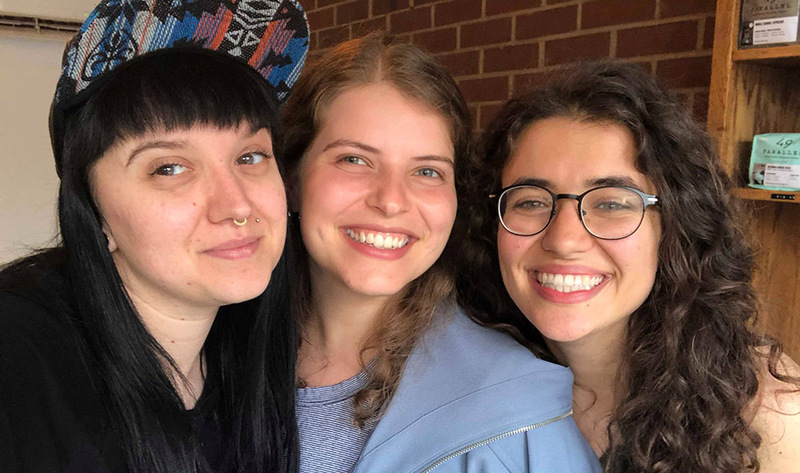 Visual artist Dayna Danger (left) with Emily Siskos (centre) and Alexia Olaizola in Montreal. Their research has been funded by a unique award available only at McMaster. Created in 2012 by Mac grads Glen Bandiera and Jolie Ringash, the Renaissance Award is open to students of all levels from all Faculties. The award challenges students to think outside the box and create a learning experience that explores a subject not covered in their degree program. Olaizola’s and Siskos’s project was one of two successful applications this year, out of a pool of 37. Their itinerary has taken them to Halifax, Montreal, Ottawa, Toronto, Hamilton, Winnipeg, Calgary, Vancouver, Victoria, and Manitoulin Island. They are ending their trip with a visit to Nimkii Aazhibikong, an Indigenous-led arts, language and culture camp for youth and elders located north of Elliot Lake, Ontario. Olaizola and Siskos prepared for their journey by auditing Indigenous Contemporary Art from 1960 to the Present, taught by Rhéanne Chartrand, the inaugural curator of Indigenous art at the McMaster Museum of Art. Their project supervisors are Dr. Rick Monture, associate professor in McMaster’s Indigenous Studies Program and English & Cultural Studies, and Carol Podedworny, director and curator of the McMaster Museum of Art. This isn’t the first time that Olaizola and Siskos have travelled and studied as a team. They met in their first year of the Arts & Science Program, lived in the same residence, and went on exchange together to Lyon, France. Both aim to work as policymakers in Canada. They hope to bring the knowledge and experience they have gained from this journey into careers in health, economics, and sustainability. However, they stress that they have only scratched the surface with this cross-country project.